Just wanted to say thank you so much for helping us out with everything, you really made our holiday easy. We would recommend your place to anyone, it was absolutely perfect for what we were looking for. The kids absolutely loved it and I think it’s the first time I have come back from a holiday feeling completely rested. I am sure we will be back next year. One of our best holidays ever! We have done many holidays like this, but this by far has been the best value and luxury. We didn’t realise that all the buildings in front of the house are part of the property, once you close the main gates, you are in your own little/big heaven with a vast courtyard, crazy size house and extensive garden, which the kids loved, along with the large pool. Everything is walled in and secluded, so we hardly saw the kids, but could relax knowing that they couldn’t go anywhere. Everything was clean and tidy, and the house has been nicely furnished. Patti and Hugh were great as they were always available when needed without being intrusive and nothing was too much trouble. Thanks again for a fantastic holiday. We would highly recommend you. Thank you for writing such a lovely review, you were great guest and we hope to see you again in the future. 13 of us stayed at Hugh and Hattie’s wonderful chateau. It was the most amazing week, the house is fantastic, incredibly spacious, clean and with everything we needed. We had an amazing time in the pool and garden having lovely dinners outside as well as in the large dining room. 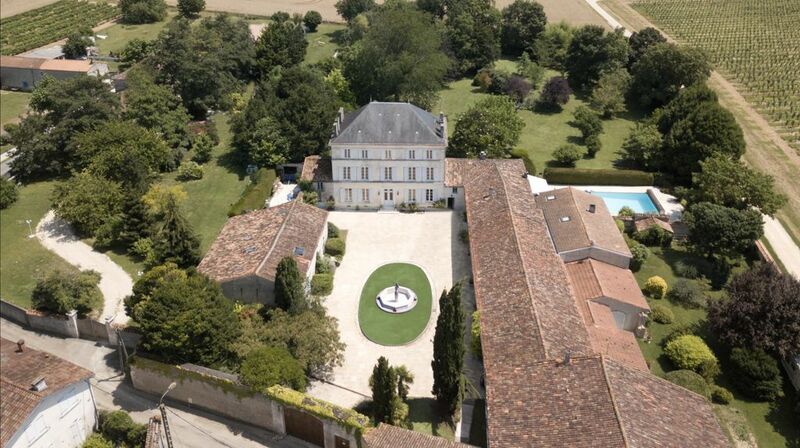 The chateau is extremely private in its own grounds. There are wonderful towns nearby with canoing and supermarkets. I would recommend this place to anyone. We will be definitely come back! Thanks so much Hugh and Hattie! Thank you so much for the glowing review. It was lovely to meet you all and a pleasure to have you here. Thanks again for sending those amazing photo's of the house. It would be lovely to have you all here again. Have a wonderful rest of the year. A fantastic house with large garden and fabulous pool. We had a superb holiday in this delightful property. We were a party of 14 and needed 7 bedrooms which it offered. The pool was great and a real treat to enjoy everyday especially for the two children. The large garden and good sized rooms meant we all had space when we needed it. Hugh was a lovely host. Close enough to speak to when we needed to but never intrusive. We would certainly return. Thank you so much for your review it was a pleasure having you here. You were a delight and left the house In immaculate condition. It would be lovely to have you come again. Three generations - 13 of us, aged 11 to 77 - spent two weeks in this lovely property. We had every meal in the garden, taking full advantage of the extensive garden (with red squirrels), the BBQ and the sunshine. The large pool was a great plus. Fast Wi-fi to keep us happy when we weren't exploring or swimming. Fresh croissants and chocalatines from the boulangeries in nearby Rouillac started each day. We hardly needed to eat away from the house, but the nearby restaurants in Rouillac and Aigre were excellent value for money and catered for us all very well. Angoulême, Cognac and Santes all within easy reach. Plenty of opportunities for sampling Pineau de Charente (a real local bargain) and Cognac. The owner, Hugh, who lives on the site, was unobtrusive but always willing to provide help and advice. A real treat for us all. Highly recommended for an extended family. We were a party of 14 - 3 families mostly with teenage children. We had a great time. The pool is large and secluded, but we did have to fight for loungers as there aren't enough for all of us. The house was great as all the children stayed on the top floor - plenty of room for them all- and the adults on the first floor in lovely big rooms. The house has a calm feel to it and we barely left other than to buy a bit of food. If you want a chilled relaxed holiday in beautiful countryside with good local food, this is the place for you. Hugh made us feel very welcome. PRICES QUOTED ABOVE ARE FOR GROUPS OF UP TO 14 PEOPLE. SPECIAL RATES FOR PARTIES SMALLER OR LARGER THAN 10 CAN BE ARRANGED. PLEASE CONTACT THE OWNER FOR DETAILS.